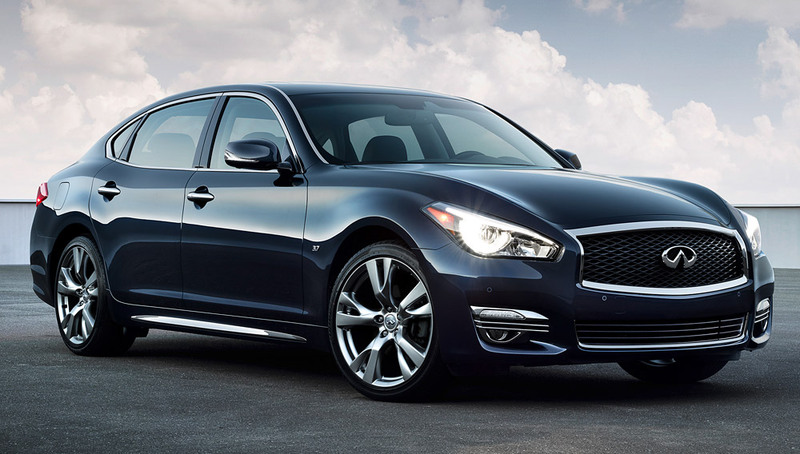 The Infiniti Q70L has much to offer over the standard Q70 performance luxury sedan – specifically a 5.9-inch longer wheelbase, 5.6 inches of additional rear seat legroom (41.8 inches total) and 5.9 inches of extra knee room (32.5 inches total). Along with its first class-style space, the Q70L is designed to provide smooth, luxurious ride comfort for all seating positions. And, as expected of Infiniti’s flagship sedan, the Q70L offers all the evocative design, invigorating performance, innovative technology and superior craftsmanship of the standard wheelbase Q70, including a choice of 3.7-liter V6 and 5.6-liter V8 engines and rear-wheel or all-wheel drive. Available advanced technologies include Predictive Forward Collision Warning, Around View® Monitor with Moving Object Detection, Backup Collision Intervention and Forward Emergency Braking. Also offered are an advanced Infiniti Navigation System, Bose® Studio Surround® premium audio system, Blind Spot Warning, Blind Spot Intervention, Lane Departure Warning and Lane Departure Prevention systems, Enhanced Intelligent Key, Intelligent Cruise Control, Distance Control Assist and Front Pre-Crash Seat Belts.